Check out BattleShip Coordinate Graphing! In a shameless effort to trick my students into liking coordinate graphing, I spent the past few days bribing them to identify the correct points with fun games. Click on the picture above to link to by tpt account. Check out more "Math Monday" ideas below! Thank you for linking up at Math Monday! I want to try this game out soon!! I love your ideas! It really makes me miss teaching math! @ Cindy - No problem! If you do try it, I'd recommend using the modified version that I just added! Your posts always make me want to teach math or science, but I think I will stick to my 3 ELA classes! I left you a few awards over on my blog too! Be sure and "pick" them up! @ Katie- You're so sweet! Thanks for the kind words and awards! haha, I really liked teaching ELA 2 years ago, I would love to teach it again! 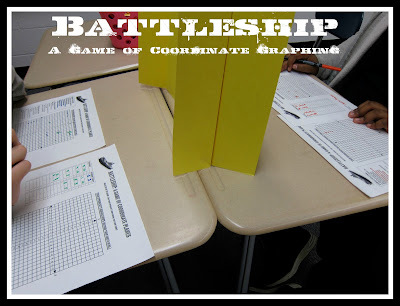 Would you mind sharing your battleship coordinate game with me? I tried to find it, but couldn't. I'd love to try this with my students!